ACP 2013 | The Campanil is headed to the ACP Conference in San Francisco! Like all years past, The Campanil is headed to this years Associated Collegiate Press Conference, or ACP – this time right over the bay in San Francisco! There will be no new print issue next week as we will be gone this weekend from Thursday, February 28 until Sunday, March 3. Full of workshops and seminars, this conference is as much for our readers as it is for our staff. We want to learn more and up our game so we can produce the best newspaper possible to keep you in the loop with all the Mills news. While we won’t be traveling far, we will be keeping you up-to-date on our happenings – whether it’s about the view from the hotel, or about how our Sports and Health Editor Eden Sugay is going to show what women can do when she serves on a Sports Reporting Panel. 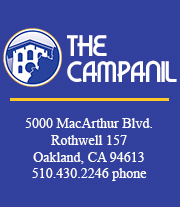 So tune in for personalized staff blog posts on our Tumblr, Facebook updates, Instagram pictures, Vine videos, and tweets to get the low down from all of us at the Campanil. We’re sure to have a good time and learn a lot, and we hope you enjoy it, too! All of our blog posts will be on the ACP 2013 page on this website. You can also find the link on the header at the upper right hand corner. Follow us on Twitter @thecampanil and tweet at us using the hashtag #acpsf.